What is the one thing that most represents Christmas to you? If you’re like many, the answer is a Christmas tree. Now, whether that tree is put up the day after Thanksgiving or the night before Christmas, whether it’s grand and glowing with decorations or small and simply adorned, that all varies. But the tree itself, that’s something a lot of us have in common. The finding and decorating of the family Christmas tree may be one of our most ubiquitous holiday traditions. One of the most widely grown Christmas trees, the Virginia Pine has short needles, dense foliage and a pleasant pine scent. Its strong branches make it an excellent choice for hanging heavy ornaments. White Pine is a dense, full tree with has soft, blue green needles, a pleasant pine scent and decorates well with lightweight ornaments. One of the most popular Christmas trees, the Leyland Cypress drops very few needles and with proper care, will easily stay fresh through the entire Christmas season. In addition to being a beautiful tree with soft foliage, it is grown from cuttings and does not produce pollen; therefore enabling many asthma suffers to enjoy a real tree in their home. One of the newer species developed for Christmas trees, the Carolina Sapphire has foliage that is blue green in color, soft to the touch and very dense with an outstanding aroma. 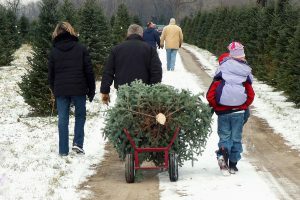 Because of its tendency to dry out even in water stands, it is recommended not cutting this type of tree until three to four weeks before Christmas. If you grew up in the South, you probably had this type of tree in your home as a child. The traditional native Christmas tree of the South, the Eastern Red Cedar has a wonderful cedar aroma with dense (and sometimes prickly) foliage. Like the Carolina Sapphire, it can dry out even in water stands, so its best not to cut this tree until two to three weeks before Christmas. In the Charleston area, most Christmas tree yards open shortly after Thanksgiving. And if you want to pick and cut your own tree, you can do that as well. The South Carolina Christmas Tree Association has an online directory of Christmas tree farms in Charleston and nearby counties. No matter where or how you find your tree, here’s a bit of Christmas trivia to take with you. The first Christmas tree was decorated in Riga, Latvia in 1510. Men of the local merchants’ guild decorated a tree with artificial roses, danced around it in the marketplace and then… set fire to it. Thankfully, some things changed over time. 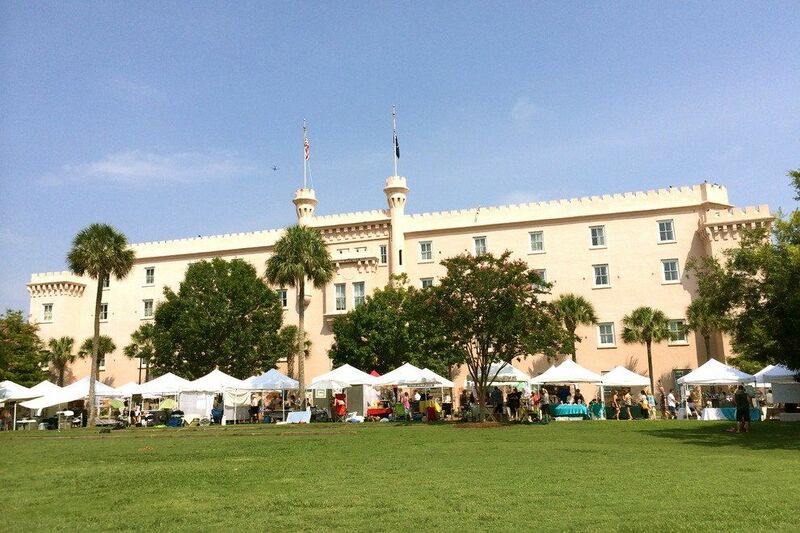 What’s Not to Love about the Charleston Farmer’s Market? Every Saturday in Marion Square, right in the heart of Charleston’s Historic District, you’ll find a weekend favorite of locals and tourists alike. It’s the Charleston Farmer’s Market. But the CFM is more than just a farmer’s market; it’s a source of pride and connection for the entire Charleston community, bringing together people from all parts of the Lowcountry and beyond. Founded by Mayor Joe Riley in 1988, and the Clemson University Cooperative Extension Service, the Charleston Farmers Market (CFM) has received numerous awards: in 2005, it was awarded the Three Sisters Award from the Charleston Save the City Committee; in 2008, the CFM was ranked by Travel + Leisure Magazine as one of the top 10 Best Farmers Markets in the Nation; and the Charleston City Paper Readers’ Poll, readers have named CFM the “Best Outdoor Event” for seven years in a row (and running). There’s many reasons for all the rewards: you’ll find over 100 local vendors, offering everything form local produce, plants, herbs and cut flowers to breakfast and lunch vendors, live entertainment and an assortment of juried arts and crafts from local artisans. “Whether you stop to grab a bite to eat, get your local grocery shopping done, find a one-of-a-kind gift for a loved one (or for yourself) or relax while enjoying live music on what we like to call, the largest outdoor dining patio in all of Charleston your entire family is certain to enjoy a memorable Saturday at the market,” says Harrison R. Chapman, CFM Manager. 1) Bring cash and small change. Your purchases will go easier and faster if you have exact (or close to exact) change. Some vendors accept credit cards, but most deal exclusively in cash, and almost all the vendors will appreciate your single and $5 bills. 2) Bring your own bags. Not all vendors offer bags. Your precious purchases will be easier to carry if you bring your own large bag with handles or, even better, a backpack. 3) Talk to the farmers. If you see an unusual looking item and and want to give it a try, ask the farmer how to prepare it. For the best tips ask how they like to eat it. 4) Know what’s in season. CFM is open every Saturday, from April 8th through November 25th, 8 AM to 2 PM as well as Saturdays and Sundays in December during Holiday Magic for the Holiday Market.